No this isn’t sushi, it just looks like it! It’s actually Gimbap (Kimbap) which literally translates to seaweed rice. It is made of steamed white rice rolled in sheets of dried seaweed and rolled with a variety of different ingredients. The rice is different than sushi rice, it is made with sesame oil and a little sweeter. This gimbap roll in the picture has Galbi, carrots, egg cake, cucumber, and pickled radish. You can buy Gimbap from street vendors and some restaurants are dedicated to making it. It is very tasty (and for those who don’t like sushi because it is raw, Gimbap is all cooked) and comes in many different mixes. 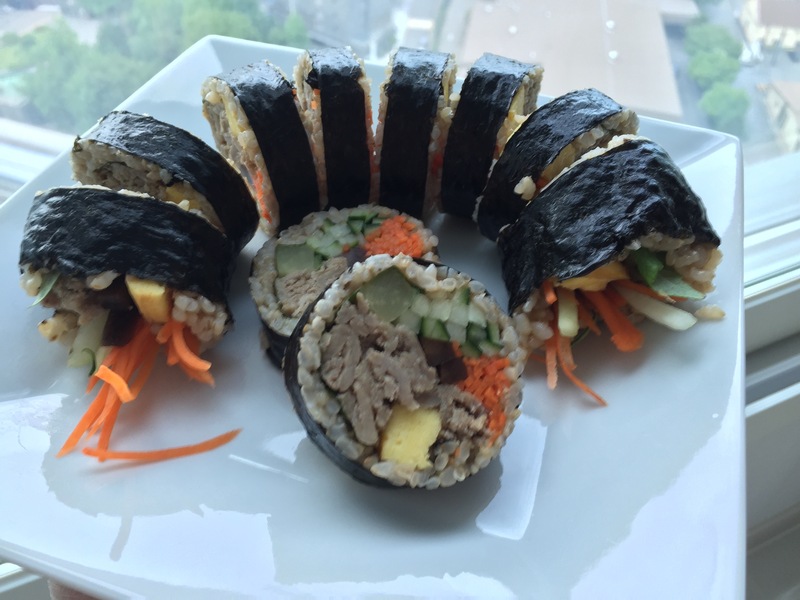 If you love sushi and haven’t had Gimbap yet, make sure you give it a try!! To learn how to make this yummy dish yourself, click here.